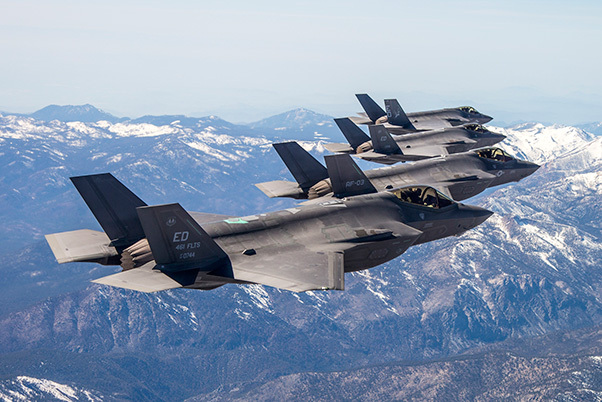 Flocking together: Three F-35As and an F-35C are pictured with the Sierra Nevada Mountains in the background during a recent four-ship test sortie conducted by the 461st Flight Test Squadron. Testing is done to ensure data is shared appropriately and accurately between aircraft. All three variants of the F-35 Joint Strike Fighter are being used by the 461st Flight Test Squadron at Edwards Air Force Base, Calif., in recent multi-ship testing, which employs four or six jets to ensure communication systems between the planes are working properly and accurately. The F-35 contains state-of-the-art tactical data links that provide the secure sharing of data among its flight members as well as other airborne, surface and ground-based platforms required to perform assigned missions. The MADL is a high-data-rate, directional communications link that allows secure transmission of coordinated tactics and engagement for the fifth-generation fighter when operating in high-threat environments. LeClair said his squadron is specifically testing the ability to find SAM systems using a capability called Enhanced Geo Location. 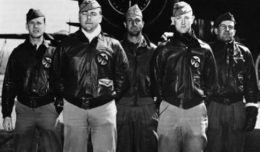 He added that the MADL architecture is divided into flight groups so it is important to test the capability to pass data between flight groups using four or six aircraft to ensure system accuracy, stability and usability during large force exercises and actual combat. 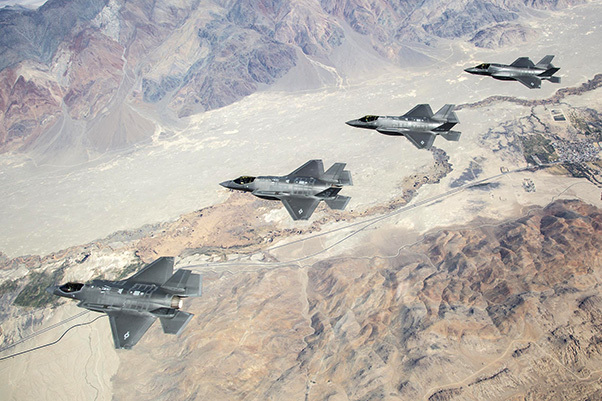 According to the Air Force, the F-35 has unprecedented situational awareness. The F-35’s advanced sensor package is designed to gather, fuse and distribute more information than any fighter in history, which gives pilots a decisive advantage over all adversaries. The F-35 is designed to replace aging fighter inventories including U.S. Air Force F-16s and A-10s, U.S. Navy F/A-18s, U.S. Marine Corps AV-8B Harriers and F/A-18s, and U.K. Harrier GR.7s and Sea Harriers. The 461st FLTS and Joint Strike Fighter Combined Test Force at Edwards conducts developmental test and evaluation of the F-35 with all three variants – the A, B and C models. Developmental test and evaluation will make way for future operational tests. “As we approach the end of System Development and Demonstration phase, many of our capstone testing events will be multi-ship to ensure compliance with the requirements before transitioning to operational testing,” said LeClair.